We have become more interested in current individual performance (see the itinerant NBA star) than collective group history (see baseball rivalries). Our pop storytellers in news and entertainment have reduced (betrayed?) storytelling to the serial exploitation and humiliation of others, requiring us to consume many, many exploitative and humiliating moments to maintain emotional investment in current programming and to norm ourselves to believing such entertainment is okay. Surviving long-form narratives (such as the first Obama campaign) have failed to deliver the ends that they promised. We have become producers of our own fleeting and episodic narratives – participants in our own stories – that we do not want to end (we want more hits on our next YouTube video; we want to skate or snowboard one more line; we want to play one more round of multi-player deathwatch; we want to play more D&D; we want to keep on Occupying). How we create and experience new, collapsed narratives is not always without reward or real benefit (Rushkoff shares a beautiful, sad story of VR therapy tweaked in real-time response to his recall). I’m sure I’m missing something. I hope other readers will chime in below. I’ll come back after I read more and make any corrections. 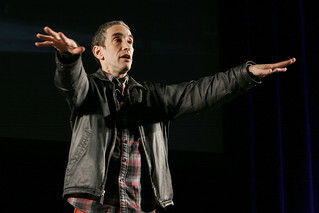 I’m especially interested in how Rushkoff’s notion of “narrative collapse” relates to schools. Think of the lesson plans teachers write, despite knowing that no plan survives contact with students. Think of each unit, pacing guide, or curriculum as a narrative waiting either to collapse or to capture students inside of it as the narrative of that content. Think of the stories teachers and students want to tell as defense mechanisms when classes, lessons, units, curricula, and policies go awry. Think of each academic year for a kid as one chapter in a thirteen-year-long, long-form narrative. Think of the kids cast in stories in which they are considered the villains of everyone else’s stories. Think of each academic year for a teacher as either the same repeated, long-form narrative or as another failure to satisfactorily achieve the “good teacher” narrative. Think of each new policy initiative as a chapter in a longer narrative about the perfect or globally dominant American school system and about how that narrative is patently unachievable and perhaps even undesirable in certain ways. Of course, narrative sometimes works, and narratives that privilege the privileged often work for them. I think exceptional narratives still help people. But school does not provide exceptional narratives. Sometimes the people in it do, but the System is suffering narrative collapse. The System wants us to norm one another to a society that rewards the school-compliant. Is that society still ours? If so, for how long? Is it possible to conceive of a curriculum- or narrative-less space inside a school? A space that is a pause from school’s grinding narrative? A space that is for episodic and rhizomatic learning that builds over time from the connections made between micro-narratives, rather than from connections inside one macro-narrative? Can we imagine student occupied, produced, collected, and connected works as evidence of learning if we do not guide the kids or dictate the parameters of their work? Can we imagine and value teachers who hone and hold to inquiry, improvisation, and intent? I am so glad that I persevered through this piece to the end. It supports my theory that, no matter how much curriculum, planning and good intentions, what is delivered in many classrooms could be irrelevant to many students. Do they sit there and silently chuckle at the song and dance we teachers go through in trying to capture their attention, interest and respect? The genie is out of the bottle. There’s no going back to when the narrative worked, I fear. As much as the reformers attempt to inject rigor, when the experience is not rapid-paced, immediate gratified learning in the minds of students, they will not receive the information as intended. Teaching and learning are dependent on relationship connections. We do not care about what others say, think or do until we believe they care about us. Thanks to all the deformation of education, instead of real reforming that matters, students are numbing out on too much of what is delivered in the classroom. Throw in some negative attitude and crankiness from frustrated teachers and we’ve got an environment where learning is next to impossible, except for that rare student who can ignore the irrelevancy and push through learning inspite of it. The more we harken back to when school was relevant and meaningful, the more resistance we may get from the students. The answer? Total revamp of the system. How? Ask the students. If they aren’t bought in to it, forget it. Information is at their fingertips today and the notion that a teacher is the only one to deliver it has passed. Could it be that one day a teacher is not longer needed, obsolete in the process of learning and students become self-taught? Chad exposes a lot of insight into what students think about the school experience, as heart-wrenching as it is to read for this veteran, retired teacher. After 35 years of teaching and as much as I loved it, I knew in my last year that I was becoming irrelevant to the process simply because of my resistance to change. God help the newbies out there. Hopefully, they will carry the relevant narratives into their classrooms for the new age learners. Good luck with keeping up with that task! I love your advice to ask the students and I hope that a kind of serially spiraling wonder can become a healthier, more human form of motivation in schools in place of gratification. I think that what happens when things don’t work hurts all of us; I certainly appreciate your perspective and experience – my mom taught for over thirty years, as well, and we talk some about the changes she observed in her career and how mine is going. Change is difficult, and resisting change is difficult; thank you for working with so many kids! It was not an ordeal to read such great writing. You taught me something new in your introduction and when I saw the connection to teaching and learning, it just made so much sense on a level I hadn’t thought of before. Kudos to you for your keen insights. We are counting on teachers like yourself to bring education to the heights that your mother and I enjoyed for so many years. You matter more than you know. Sandy, I’m glad to have you reading and thinking here with us – please keep sharing.